Named after a workaday knife wielded by shepherds and farmers in the high pastures of the Alps when a tool for paring, shaping, cutting into, scraping out of, or freeing is useful, these poems likewise cleave away the false and deceptive to clarify and reveal a startling and unifying wonder. In language radiant, lovely, and disturbing, Rebecca Kaiser Gibson explores the linkages between the uncomfortable familiar and the curiously intimate strange, making unexpected connections between phenomena. Arranged by association rather than chronology and connected by a sensual intelligence, this collection wanders from Maryland and India to Boston, France, New Hampshire and Irelandfrom Ezekiel's Flight and the Book of Kells, to the Tamil goddess Meenakshi. 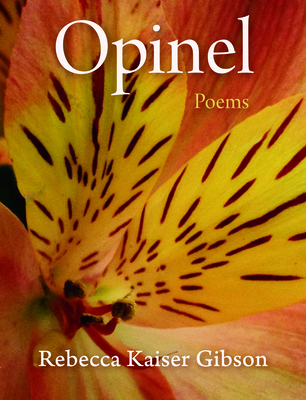 REBECCA KAISER GIBSON teaches poetry at Tufts University. She has been published in Agni, Antigonish, the Boston Phoenix, Field, the Greensboro Review, the Harvard Review, MARGIE, Mothering, Northwest Review, Pleiades, Salamander, Slate, the Adroit Journal, 236 Magazine, Tupelo Quarterly, the Taos Journal of Poetry and Art, reprinted in an anthology called Cadence of Hooves, and featured in VerseDaily. Two of her chapbooks have been published: Admit the Peacock and Inside the Exhibition.